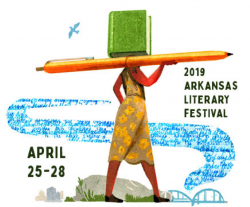 So excited to visit my home state and be part of the Arkansas Literary Festival at the end of April. I’ll be spending all day Thursday, April 25 with students at the Museum of Discovery. And on Saturday, April 27, I’ll be speaking at the Main Library at 11:30 a.m. If you’re in the Little Rock area, hope you’ll join me then! 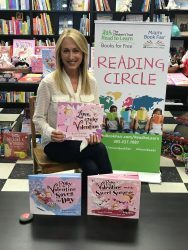 Thanks again to Books & Books Suniland and Reading Circle for a fabulous morning of books and Valentine’s Day fun! Hope to See You All on February 9! 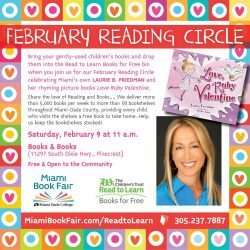 So excited to be reading Love, Ruby Valentine at Books & Books on Saturday, February 9 for February Reading Circle. Hope you’ll come out and bring your kids for a morning of fun! 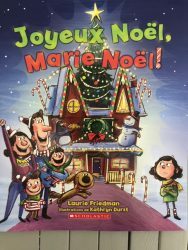 The holidays were extra special this year with the French version of Merry Christmas, Merry Christmas now available! Happy New Year and Bonne Année to all! 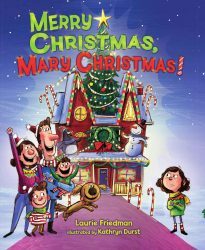 Thanks to this nice Amazon fan who made my holidays even happier with this sweet review of Merry Christmas, Mary Christmas! One of the things I love most is helping other authors shape and mold their stories. Especially picture book authors! If writing a picture book is on your bucket list, I hope you’ll check out the new Critiques page on my website and let me know if I can help! I’d love to help you take the next step towards publication. One of my favorite holidays, Thanksgiving, is almost here. One of the things I’m grateful for: nice reviews! 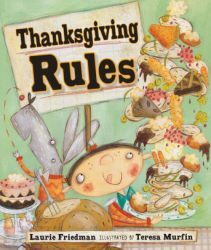 Love this one from an Amazon fan about Thanksgiving Rules! Good news! 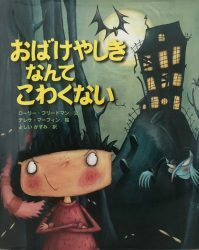 I’m proud to announce that I’m Not Afraid of This Haunted House is now available in Japanese. And just in time for Halloween! About the book: Simon Lester Henry Strauss isn’t afraid of anything! Not witches. Or ghosts. Or ghouls. The creaky old haunted house doesn’t scare him. When his friends all run out in fear, Simon Lester bravely proclaims he’s not scared one bit. But in the end . . . everyone is scared of something. Even Simon Lester.